A violin is a stringed instrument that is played by drawing a bow across the strings to create a ringing sound and by plucking the strings to make a pinging sound. A violin is played by placing the end of the instrument under your chin and supported on your shoulder while holding with your hand at the neck. A guitar is also a stringed instrument, but is played by strumming the strings with either a pick or fingers or by plucking the strings with fingers. A guitar is played by holding at approximately waist level and is supported by your hand at the neck, and a knee at the base, or completely supported by a strap that hooks around your neck. A violin's strings are typically about half as long as a guitar's strings making it a much smaller instrument. A guitar has strings that are about 24 to 26 inches long. This length varies a bit from one manufacturer to another, but guitars are roughly twice as big as a standard violin size of 12 to 13 inches. The sound from a violin is higher than that of a guitar due to the shortness of the strings. Short stringed instruments typically play higher notes and longer string length equals deeper notes. The tonal qualities of each instrument are affected by the frets as well. Guitars will normally have frets and violins do not. A fret is the raised part of the neck on a string instrument. Four strings are on a standard violin and six on a standard guitar. 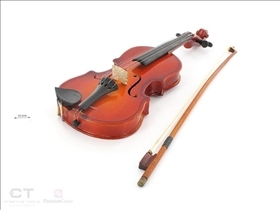 While the strings on the violin are normally is played by drawing a resined bow across the strings and a guitar is played by strumming the strings with fingers, both instruments can be played in a variety of ways to change the type of sound emitted. Depending on the style of music, either instrument may be played by plucking the strings with fingers or strummed with a pick made of plastic, stainless steel, wood or metal. The shape of each instrument can vary as well. The typical shape of the violin and the guitar are to promote a distinct amount of harmonic ranges. In addition to the shape of the instrument, the holes in each add to the sound each makes. In an acoustic (non-electric) violin, the sound leaves the violin and helps to make the distinctive violin sound from two f holes. Sound holes are not the only place sound leaves a stringed instrument, but the placement and amount of sound holes does change the vibration amount and sound quality. 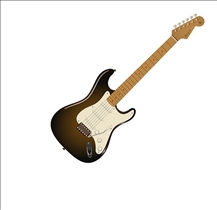 Guitars are also available with two f holes in some of the electric models, but typically, the acoustic versions have one single, circular sound hole. While there are many variations in each instrument, violins and guitars share many of the same qualities. As they are both stringed instruments, many people learn to play both instruments equally as well. Violins and guitars are both available in electric and acoustic varieties. Both instruments are used to play all sorts of music from classical to modern rock. There are four strings on the standard violin while there are six on the standard guitar. The strings on a violin are half the length of the guitar. Which instrument has a better sound? Can you please suggest me, I want to learn Violin First and then guitar is it possible ?